I've slowly been back to the hunt the past week, I have two Southern Crossing Antique Mall Booths now (hopefully I'll just have one big booth soon, on the waiting list for that) and more behind-the-scenes selling developments. A small haul for now but you'll see a HUGE one soon. 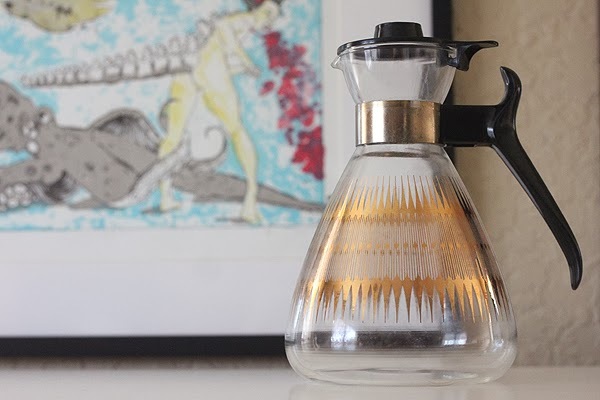 Found another beautiful coffee carafe, this time without a percolator inside. I tend to do well with these online. See it On Etsy. I was driving back from the post office when I saw a time capsule 1940s-50s brick house with a big pile of 1960s rubble in the front, gaudy linoleum, mustard yellow shag carpet and era appropriate built ins all stacked in a sad dusty pile out front. 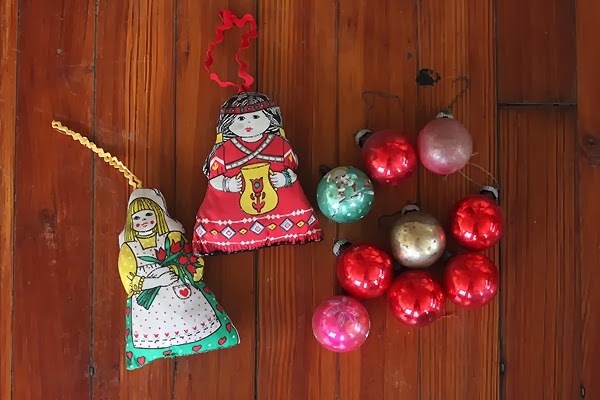 I harvested these ornaments from a tree (sadly not of the desired aluminum variety) and took home a couple of chairs that sold before I could take a photo. 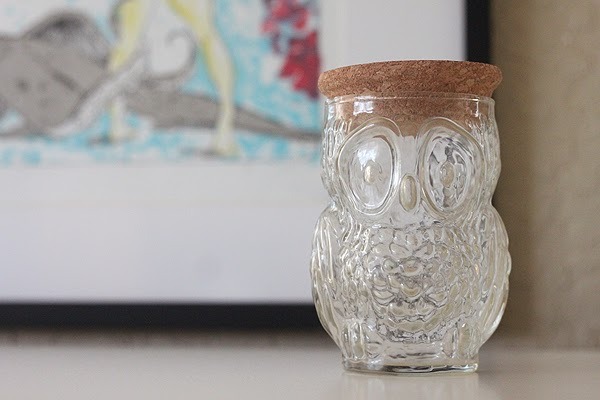 And how 'bout another gorgeous owl jar? This is perfect for holding pet food and sugar, nice and air-tight. 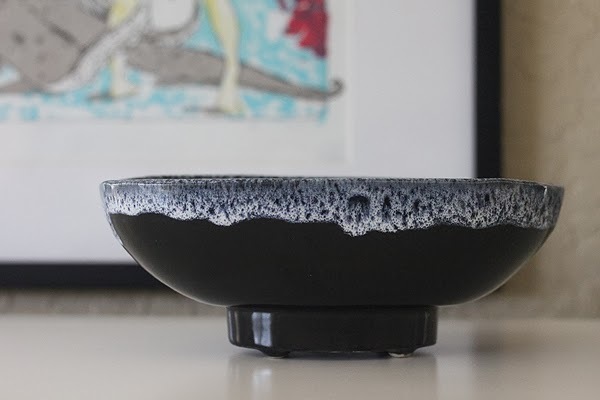 I try to resist any planters these days but this dark violet glazed one was so beautiful it had to come home with me. I've never seen one approaching this color, beautiful piece. 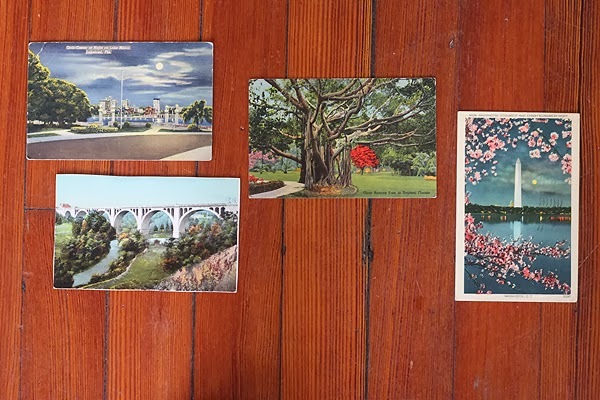 And how 'bout some beautiful post cards? I was gifted these after a vintage sale, I also received a big, beautiful doll house but I gifted it before I got any photos. I like how these ones have a painterly vibe, like someone painted over photographs? Very beautiful. I'd love to see Washington during cherry blossom season like the card on the far right showcases. 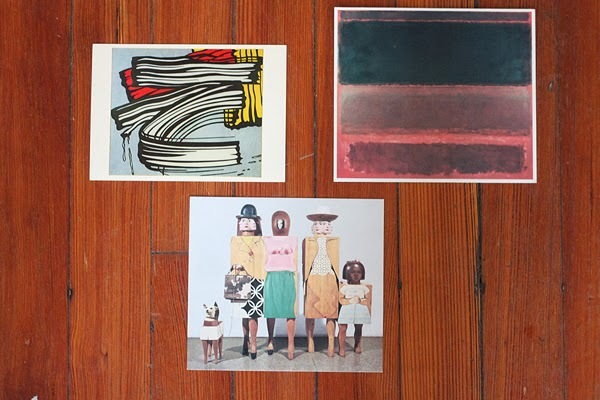 And I loved these 1960s museum post cards of modern art pieces. Beautiful art! 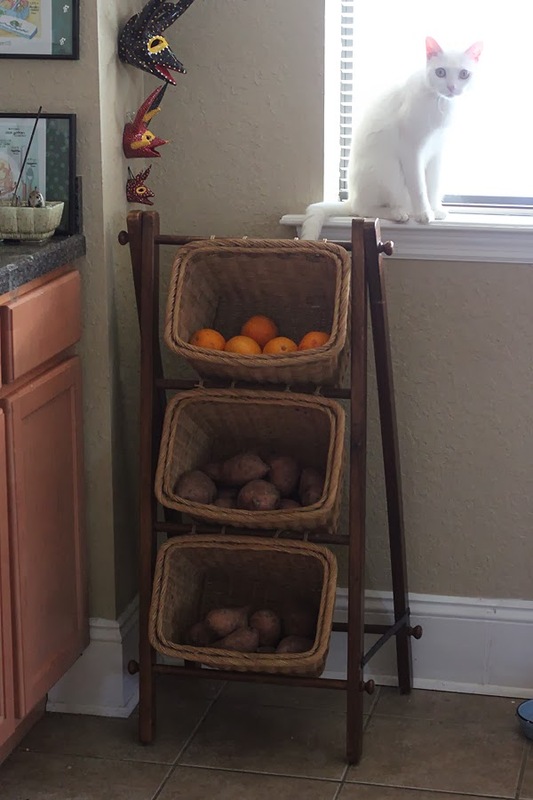 The story behind my new fruit basket's pretty funny. I live on the second floor of an old brownstone building, above a corner store. I was loading my car full of objects for my antique mall booth when the store owner handed me this basket display saying, "You want this? You can sell it, or get rid of it, or whatever it is that you do..." Hilarious. I'm an enigma to the neighbors who rarely see me leave without toting random "junk". And a final fun find, how 'bout this bulldog? 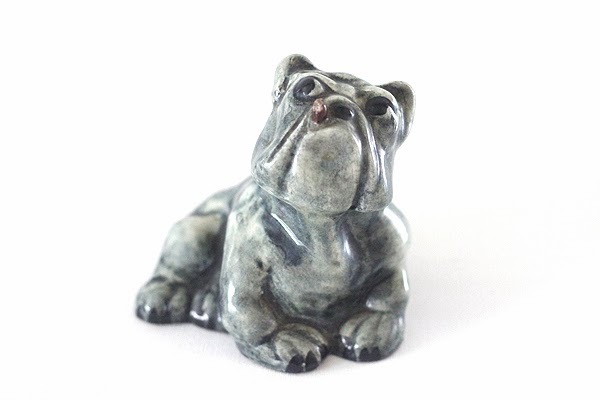 I always scoop up unique ones for my boyfriend whenever I see them, they remind me of Dozer, his Old English bulldog. 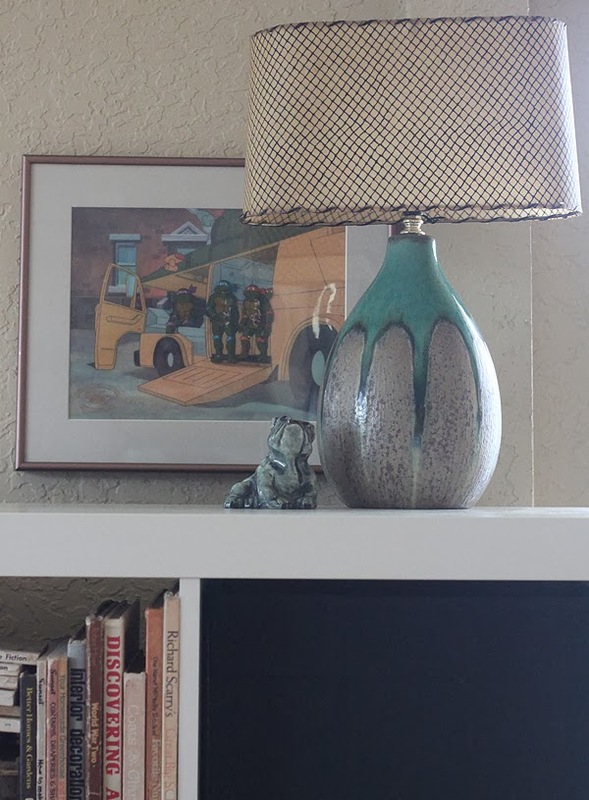 And a fav find is a gorgeous retro lamp shade I finally broke down and bought from Southern Crossing. It's hard to find these and they really make an impact in a space. I want a big collection of them to display and sell! The base isn't for sale and it's one I've had for years now. And now back to my forever-process of listing/cleaning things/organizing/writing... I have MUCH MORE vintage recently scored that you'll see next week. 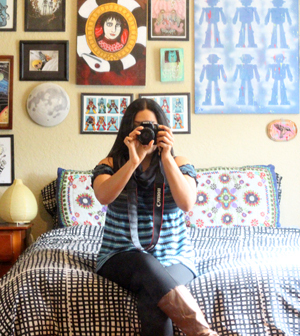 E-mail me if you see anything you'd like to buy in today's post! Free is awesome and when it's something you will use it's even better. Not a lot comes to us free, but darn close. Great finds. Keep inspiring. I want to focus on finding more free, will continue to share them as they come. Great finds! Love the planter (I don't sell them well either, just use them for organizing lately). That lampshade was a great purchase, even if they are sometimes unreasonably pricey. It looks awesome on that base too! Worth it! I want to use it with the robot lamp I recently found, trying to fix 'em up. When I do sell planters they sell for A LOT so they're worth collecting to me. A buyer in South Africa bought tons of planters from me once for hundreds of bucks, 'twas awesome. And yep, the lamp shades are usually too pricey. This one was $9, not too bad. The lampshade (and lamp) is awesome! Love your fruit-veggie shelf, funny...an enigma to your neighbors. :) Good to keep them wondering. Becoming a postcard junkie myself. I'll keep up the mystery. They probably wonder how the hell I support myself not leaving for a normal 9-5. Waste not, want not! My mom's been a lifelong trash hunter, too and we continue teaching the legacy to my nephews/nieces. They love it. What are the paper meche' heads on your wall? (by your fruit baskets) I have some like that. I have never seen them before. I found mine at the flea market, ours thrift tend to charge very little for glassware, making it hard to sell locally. You made me laugh that your neighbors think you're crazy for always coming home with random junk. I finally had to tell ours that we would buy/sell, too, because they would see me one day hauling a couch in and then hauling it back out a few weeks later. LOL! They saw tables, chairs, all kinds of stuff come and go, and they got to where they would just shake their heads and laugh. So funny. 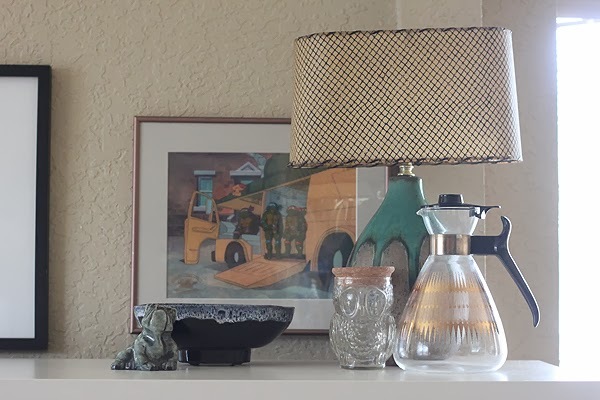 My fave in this haul is the coffee carafe, so retro. Since I don't drink coffee I'd use it for my tea :) These postcards remind me of my mom's postcard collection I check every year or so, it's a huge big box with thousand and thousand of them, first time I discover it I was 5 yo can you imagine the excitement? I'd spend hours and hours exploring that box with postcards all over the world her friends sent. Your neighbours are the coolest!! I love your new fruit baskets, you could give some color to the wood ;) My neighbours think I'm a gipsy, because I sell in flea markets and they think it's a crazy life always with boxes and bags around me :D the other day my dad brought me clothes from the garbage to sell haha oh boy! That owl jar is the cutest! I've only rescued a few items from my neighbors' curbside discards. It always plagues me how people can throw away perfectly useful items that could be donated/given away. Heck, I'll take it! Thanks, the lamp's been around for a while, so many want to buy it from me. The shade will go to the epic robot lamp I found after it's been fixed. Oh man, that lampshade is worth any price - I LOVE IT!!! I am also smitten with your freebie. What an incredibly versatile, functional, and smart-looking piece! It looks so great filled with oranges and root veggies but I can also see it in a bathroom holding towels, toiletries, etc. NICE! Thanks! I agree, very practical piece that I had to scoop up to use. Would be nice in a brick & mortar retail store if I ever get one, too. Loving the owl jar!!! Why are owls so cute?? Okay, out of everything in this post, that fruit basket is awesome and amazing! I do love vintage postcards though and you got some amazing ones! I need to hurry and list those ;D Thanks! I have a huge collection of them I should showcase. 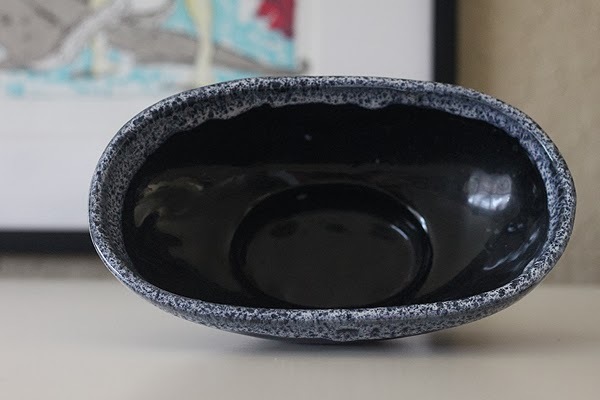 The base is an oldie than many have tried to buy, makes a great conversation starting prop. And yep, if there's a beguiling junk pile and I've got lots of time I always have to make a stop. I need tiered fruit baskets!!! They come in handy! Especially since citrus, root veggies, avocados, tomatoes, etc. are best set on out of the fridge to fully ripen. At the end of a twice yearly community garage sale, my sister and I drive up and down the streets checking out every free box, and watchful for the free piles of leftover sales. We've found amazing things! There isn't a better price than free and we are addicted to those kind of finds. Great strategy an yes, so true!